Meg's Food! 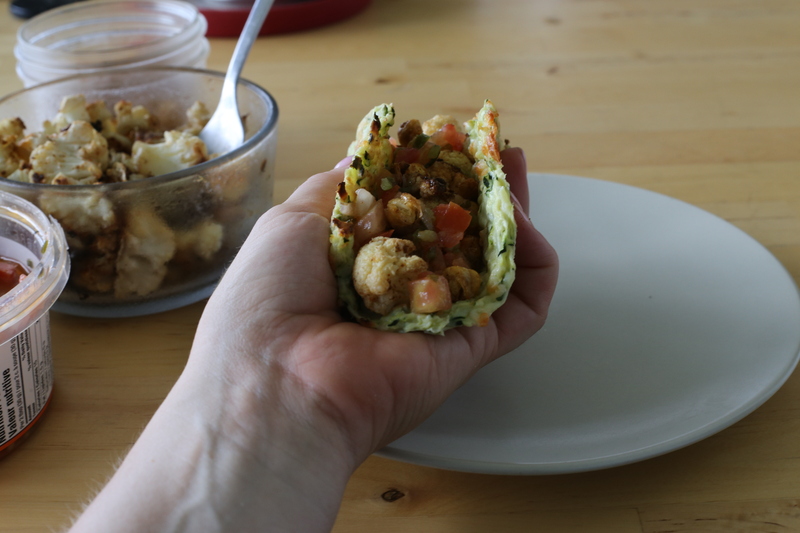 | Cauliflower and Chickpea Tacos on Zucchini Tortillas - Meg's Food! Ok so you know how you can make pizza with cauliflower? And everyone was super skeptical (myself included) but actually it’s legit delicious? Well in that same vein, I present to you the zucchini tortilla. Now before you start rolling your eyes, hear me out. It does not taste like a corn tortilla – how could it, it’s made of zucchini! But it has a delicate, zucchini-taste, along with a hint of cheese (who doesn’t like that). Best of all it’s super flexible, perfect to use as a tortilla! 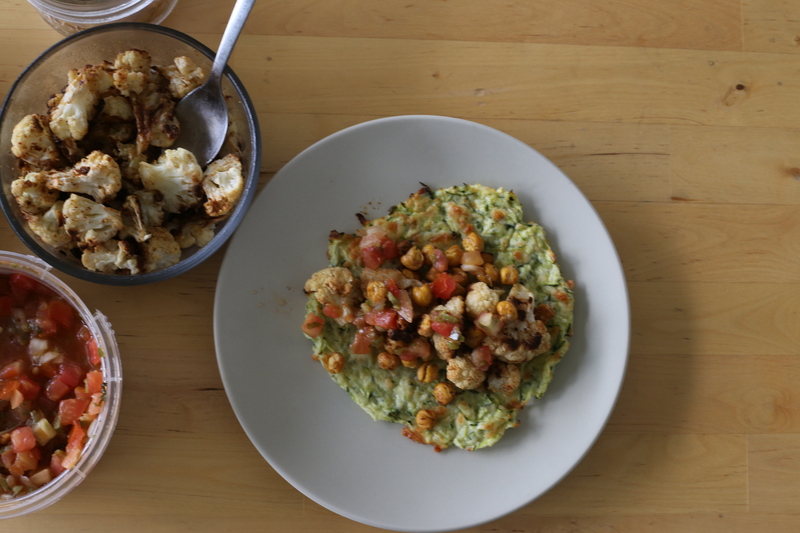 Into these green tortillas I threw an easy roasted cauliflower and chickpea combo, and topped with some spicy pico de gallo. You could add avocado, cotijo cheese, other veggies…the world is your oyster! (or taco?). Using zucchini instead of corn tortillas adds more fibre and nutrients to your meal, and is also lower in calories and carbs. You can swap out the flour for oat flour or almond flour if you want to make these gluten-free. Preheat oven to 400 and line a baking sheet with parchment paper. Grate the zucchini and wrap in a kitchen towel, and squeeze as much liquid out of it as you can. Add zucchini to a large bowl along with cheese, flour, egg, and salt and pepper. Stir to combine. Form into balls and flatten on prepared baking sheet. Bake 20-25 minutes, until dry and golden on the edges. Let cool, but leave oven on for the chickpeas and cauliflowers. Meanwhile, drain chickpeas and dry between layers of paper towel. Pour chickpeas and cauliflower onto separate baking sheets lined with parchment paper. Toss both with olive oil and season with salt and pepper, chili powder, garlic powder, and pepper flakes. Roast until cauliflower is golden, about 30 minutes, and chickpeas are crispy, about 45 minutes, tossing each every 15 minutes or so. Serve zucchini tortillas topped with cauliflower and chickpeas, as well as all your favourite taco toppings. 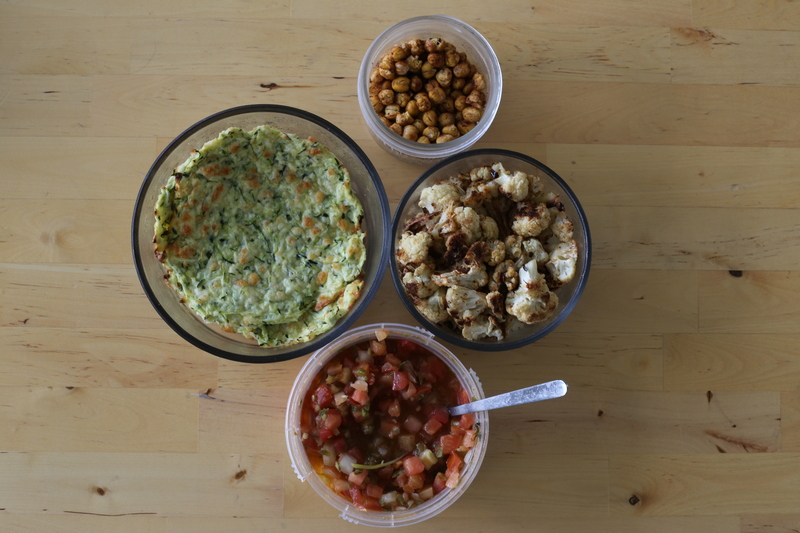 This entry was posted in Dinner, Lunch and tagged cauliflower, chickpeas, gluten free, low carb, tortilla, zucchini. Bookmark the permalink.